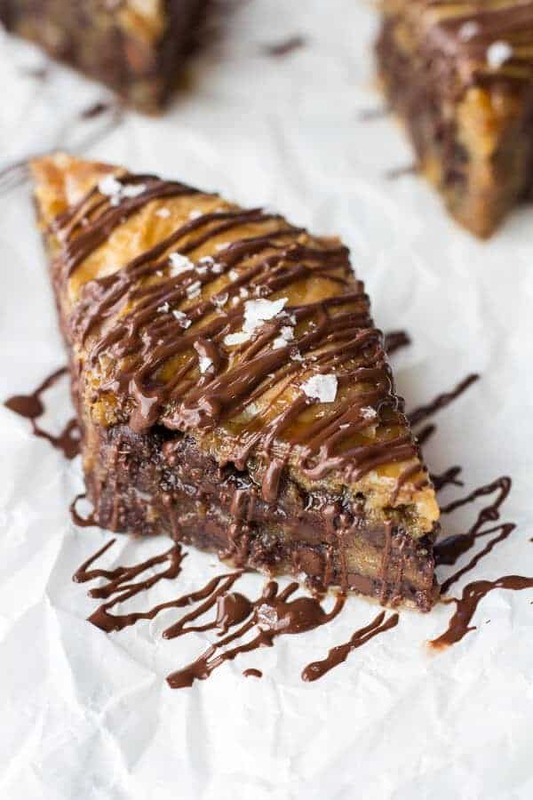 Salted Chocolate Chip Cookie Baklava. 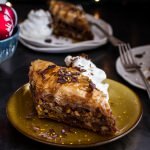 Because it is cookie season, I made this Salted Chocolate Chip Cookie Baklava for you guys! And I have yet to actually make a single cookie this December. Sure, I have made a lot of treats, but ZERO cookies. I made Sugar Cookie Cupcakes, Gingerbread Boy Granola, Potato Chip Fudge, Hot Chocolate French Toast and Dark Chocolate Coffee Bark, but no actual cookies. I did make these crazy easy Idiot Proof Chocolate Covered Pretzel Nutella Turtle cookies, but those were back in November. Gosh, it feels like that was yesterday! Fudge oh fudge, time is flying by too fast. Christmas is on Wednesday! What?!?! Anyway, this baklava is still not technically a cookie, but I am hopping you guys can just pretend because I am going to go out on a limb and say that this may just be better than any cookie. I can’t say for sure because sometimes a real cookie is all you really want or need, but let’s just think of this as one giant buttery chocolate chip cookie (Mmm!! ), with a nice, flakey crust. 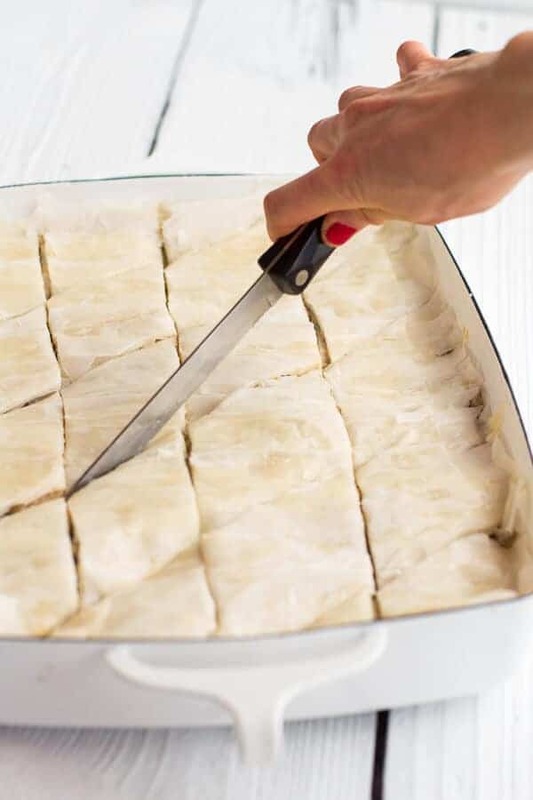 I took a lot of photos of the process because some people have the tendency to think that Baklava is hard and complicated, but I actually thought is was so easy. The hardest part is layering the phyllo sheets, but once you get the hang of it, the process flows pretty smoothly. But just in case you ruin a few sheets (trust me I did! ), I wrote for the recipe to call for more phyllo dough than you should need. If you end up having extra, use the leftovers for a savory pie, or do what I did and throw a bunch of leftovers in a baking dish with some cheese and top it with the leftover phyllo dough. The secret to this dish is layers. The layers of butter and phyllo dough. Yes, there is lots of butter, but it’s cool because Christmas is in five days so it’s totally acceptable. And do not try to tell me otherwise. Oh, and a little side note. Thank you guys all for your kind comments on yesterday’s post! Most of them were crazy nice. Which is good since I was pretty nervous to share!! You guys have demanded photos of the process. We’ll do!! But first let’s make some cookie baklava! The great thing about baklava is that it serves a ton and can be made a least a day in advance. This is obviously a great thing since it is the holidays and we should all be out playing in the snow, drinking hot cocoa and hanging with friends and family. I finally got to watch the Grinch last night. Well, I sort of got to watch it. Asher was hanging out with me after school last night and had it on while I was working, but man it is hard to work when the Grinch is on. It is one of my favorites. The Grinch and The Santa Clause movies, oh, and Miracle on 34th Street and Eloise at Christmas Time! Ok, really I just love all Christmas movies. Oh, and you gotta watch Christmas Vacation (filmed practically in my own backyard). It is a Christmas must. Oh jeez, and obviously the Home Alone movies too. Ok now really, let’s just eat some more Baclava. Beat the eggs in a large mixing bowl on high speed until foamy. Beat in flour, granulated sugar and brown sugar until smooth. Add the 3 sticks of softened butter and vanilla extract, beat until smooth and creamy. 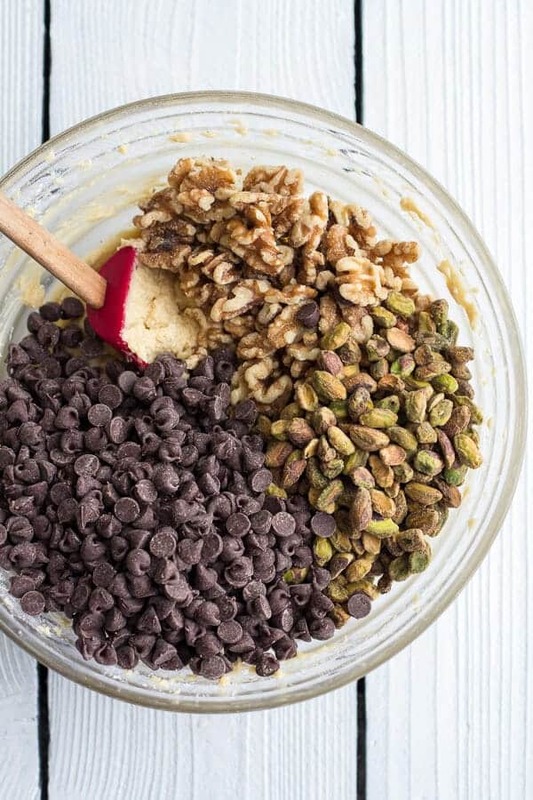 Stir in chocolate chips, pistachios and walnuts. 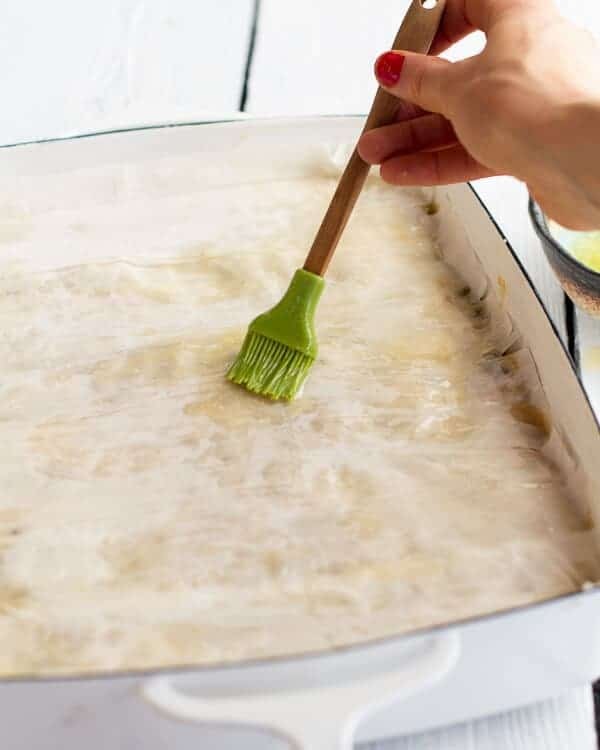 Brush a 9-by-13-inch baking dish with some of the melted butter. Layer 10 pieces of phyllo in the dish, brushing each piece with butter before adding the next (keep the remaining dough covered with a damp towel). Gently spread 1/2 of the cookie dough over the phyllo dough (the layer will be somewhat thin). Layer 10 pieces of phyllo on top, brushing each with butter before adding the next. 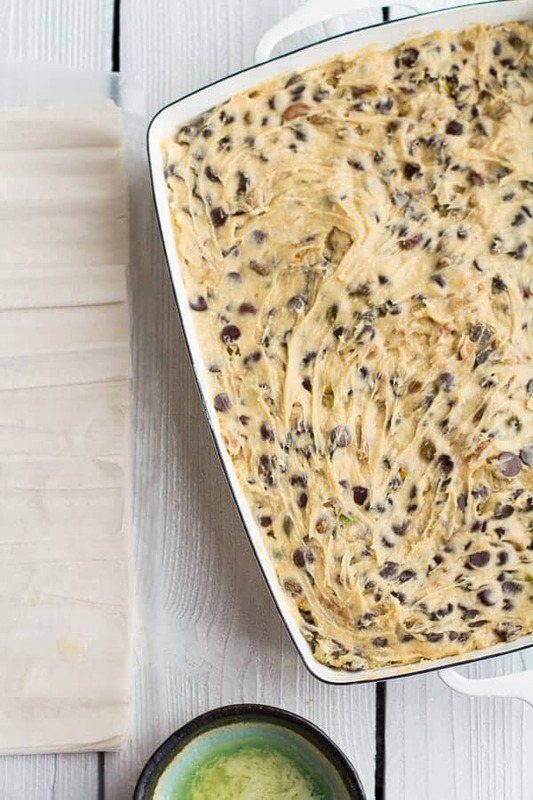 Spread with the remaining half of the cookie dough. Now add the third and final layer of phyllo dough. Layer on 12 pieces of phyllo right on top, brushing each with butter before adding the next. Cut into the baklava to make strips, about 1 1/2 inches wide. Then make diagonal slices, about 1 1/2 inches apart, to create a diamond pattern. Bake until golden, about 45 minutes to 1 hour. Meanwhile, make the syrup. Add the water, brown sugar, vanilla, vanilla bean seeds and the vanilla bean pods to a medium sauce pot. Bring the mixture to a boil, reduce the heat to medium and cook for 10 to 15 minutes. Remove from the heat and remove the vanilla bean pods. 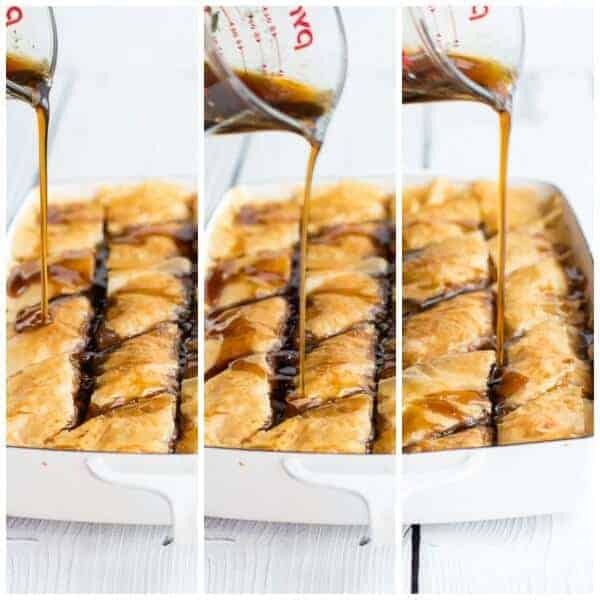 Pour the syrup over the warm baklava and let soak, for at least 6 hours or overnight (I covered my pan after about 2 hours of cooling with plastic wrap). 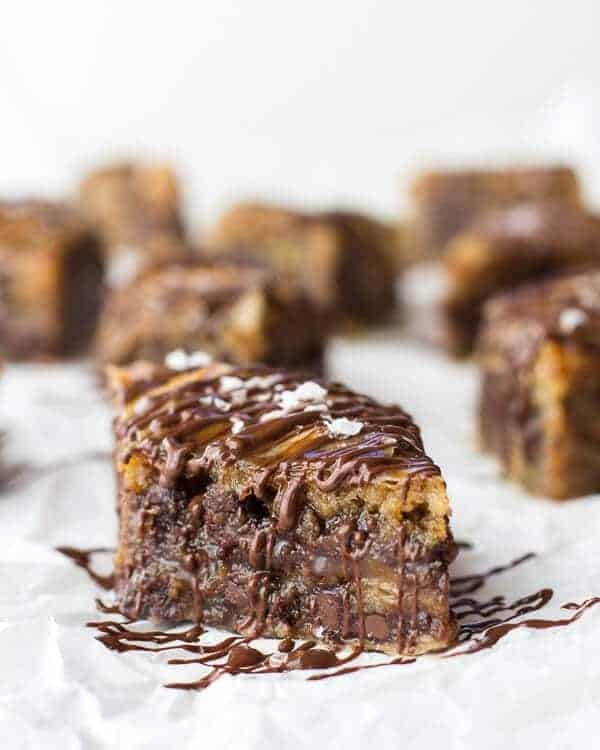 When ready to serve drizzle each piece with melted chocolate and sprinkle with sea salt. With a side of Christmas Movies. Of course! 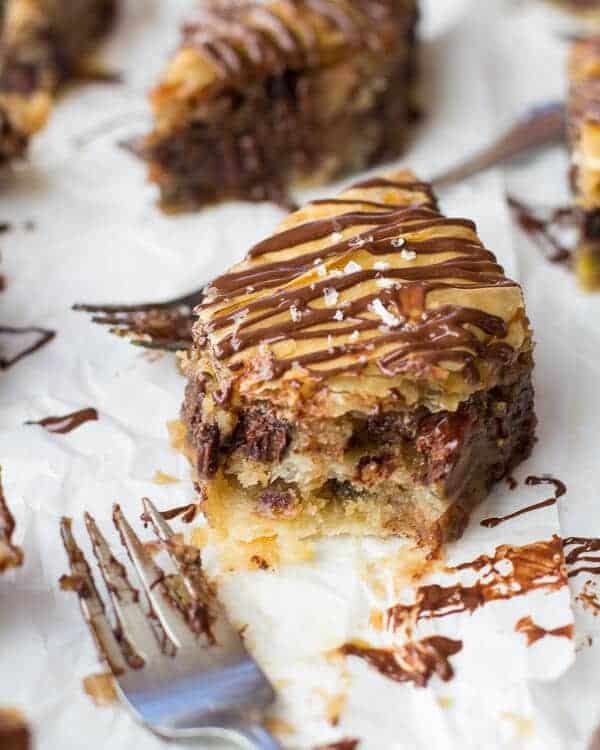 Chocolate “Candy Bar” Baklava with Butter Rum Sauce. Holy.Moly. My mouth just fell off my face! 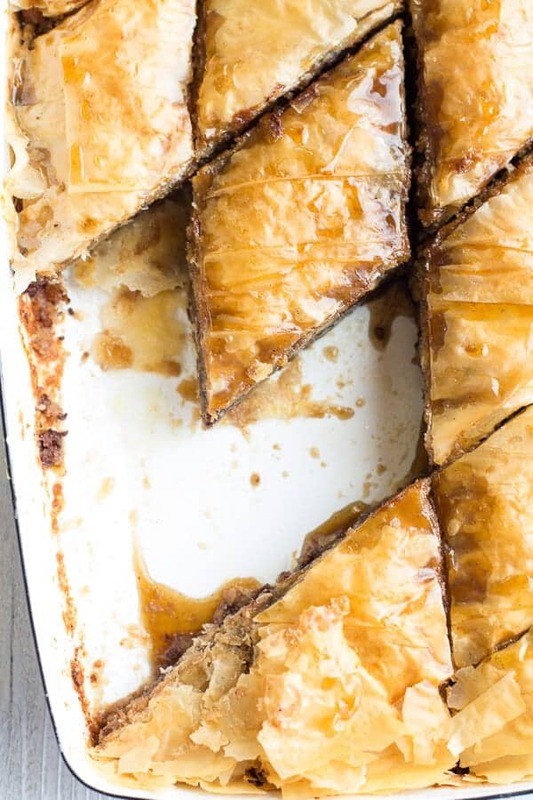 I’ve made baklava before (you’re right, not so hard!) and I’ve obviously made cookies before…but not this. never this. want this. need this now! 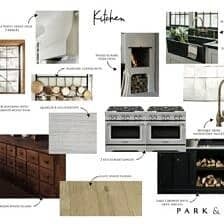 Your recipes looks delicious and your blog is delightful. Thank you for adding your creativity to the world! Wow, this is genius! Baklava is on of my all time favorite things to eat, couple that with the cookie dough, crazy good!! Thanks so much!! Hope you love this! Oh my gosh this baklava looks amazing, Tieghan! 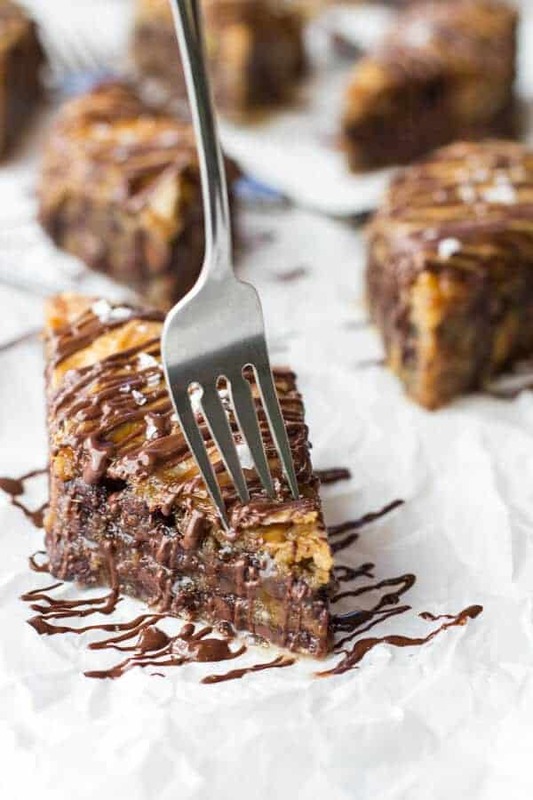 All that chocolate and cookie dough….And all the butter is absolutely acceptable 🙂 Totally worth it by the looks of this baklava. Pinned it! Thanks Averie! 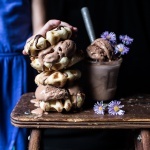 I have seen your Nutella version and every time I think it looks amazing. I must make it! 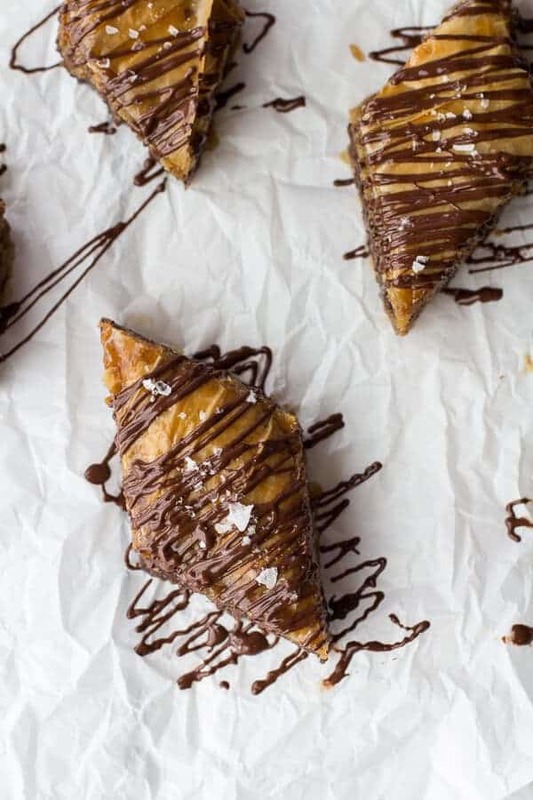 I so need to try chocolate baklava! Uhhh oh my gosh. I want your brain, girlfriend! 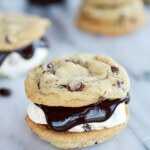 Not only are these stunningly beautiful but they also look unbelievably gooey and delicious. Brilliant. 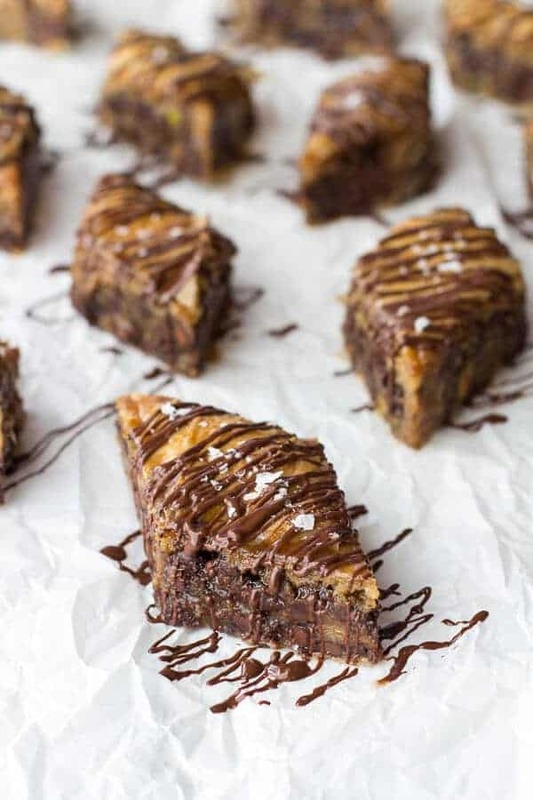 Gooey, chocolatey baklava. Ohhhh my gosh. 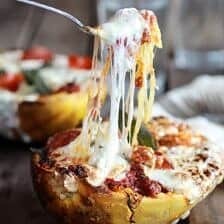 These photos are incredible, but the recipe? Consider me mind.blown. Shut the front door! 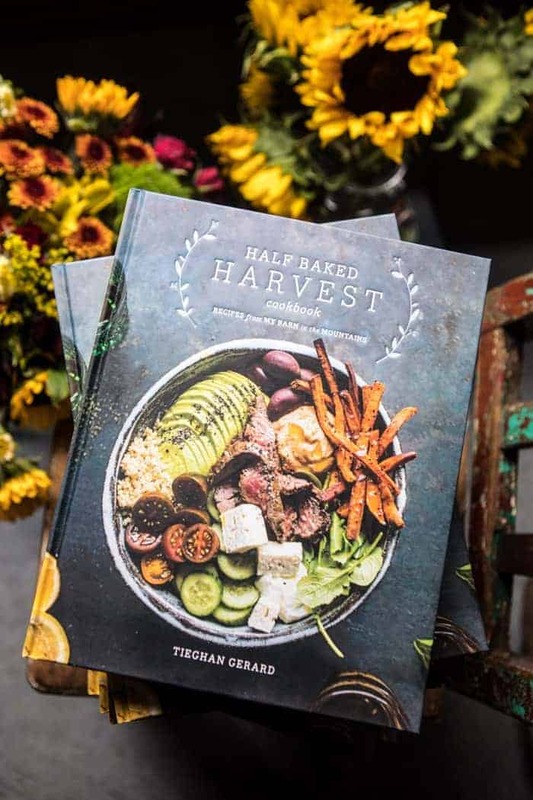 Ughhhhhhh I am Greek and I am ALWAYS on board for a twist on a classic and I think the Greek person that invented Baklava would tip their hat to you on this one Tieghan! ALWAYS impressed! Pinning and posting to facebook! This is absolute genius!! I think I need to borrow your brain for a little while to come up with a few good ideas for my own blog! I never understand when people say filo is difficult to work with – it’s so forgiving! It totally doesn’t matter if you tear a few sheets because you’re layering it up anyway – just slap another sheet on top!! Haha! I agree about the phyllo dough. So easy! So creative! Seriously, I don’t know how you think of these things. 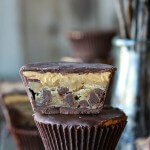 I can imagine that this took a bunch of trials with the cookie dough and baking times, etc! Oh man, you have no idea! It was worth it though!!! Thanks Laura! Oh and I am half done with my email back to you. It will be in your inbox my the end of the morning tomorrow!! Totally wicked! Tieghan, my mind is officially blown. Blown! I don’t know how you do it, but you keep outdoing yourself! Love, love, love this very creative treat. Who needs Christmas cookies when you can have this fabulous treat? I am a nut about Christmas movies, too. I just keep them going on a loop as I bake. Thanks for sharing, girl. Pinning (of course!). And… best wishes to you and your family for a meaningful and joyous Christmas holiday! Well, my mind is totally rocked. This looks so wonderful! I think my heart skipped a beat. Love everything about this! This is hands down the best thing on the internet today. Daaaaang! I love Baklava, and chocolate chip cookies, so of course this is a huge win. Thanks Jackie!! cookies and layer of butter and phyllo dough just made sense! A slew of profane words just came out of my mouth. Out loud. Because this is f-ing amazing. Am I allowed to say that on HBH? I hope so! 🙂 Have a great weekend, love! Hey, I am a-ok with it. 🙂 I grew up tons of brothers, remember? Profane words are the norm. LOL! Thanks Julia!! Hope you have a great weekend too! 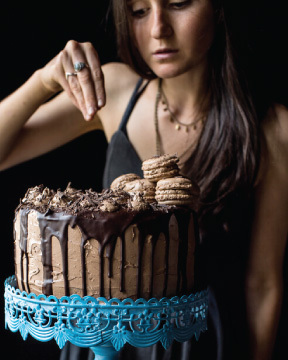 Now that is truly a decadent dessert…I can just imagine how good it is. This looks incredible!! Definitely my kind of baklava. There’s a great restaurant near us that serves a chocolate-hazelnut baklava. I love it so much that I’ve even made it at home before. Chocolate and baklava are meant to be! AGREE!! Thanks Megan! Chocolate is kind of good with all sweet! 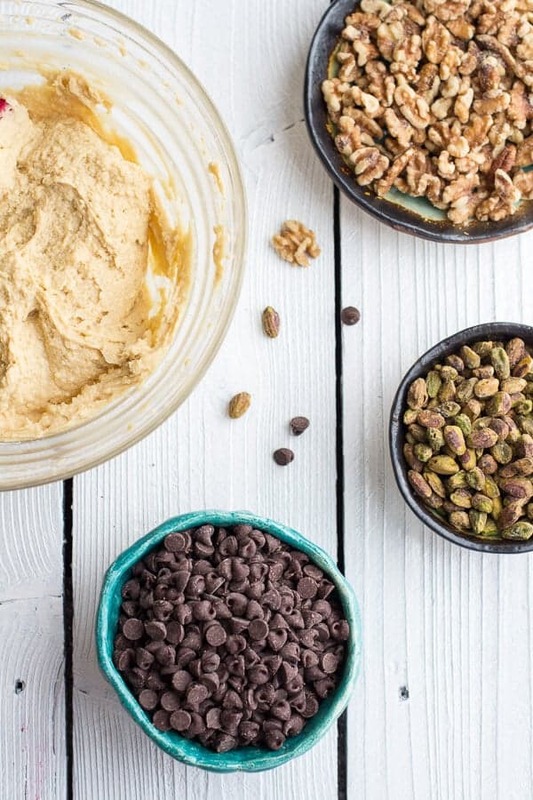 Cookie dough + baklava sounds like pure perfection! I’d inhale this! Made this today. Mine doesn’t look as pretty as yours, but it smells divine! The chocolate bark from a couple days ago tastes amazing! I almost didn’t want to share with the neighbors. Keep ’em coming! 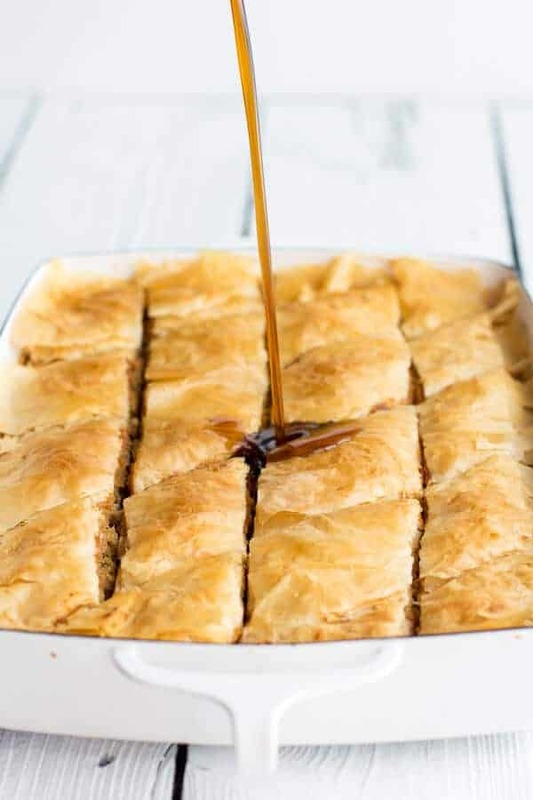 Baklava is my absolute favorite, though I’ve never tried making it at home. Salted caramel is my other favorite, so combined it just sounds dangerous. Ohhh my gooooodnesss, seriously, you’re just a brilliant human being. Why couldn’t we be neighbors!? Cookie baklava – what a great idea! This looks absolutely delicious, and so pretty! Thank so much, Cate! Hope you have a Merry Christmas! 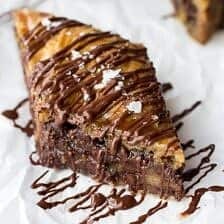 I have been searching for a chocolate baklava, this one looks so good. Love your photos too. hey Tiiegham ! i tried the recipe but the middle layers got soggyish, like didnt taste cooked. i’m sure i messed up with the recipe some where used a glass pan and i think maybe the water was acccidently added more…maybeee!! don’t remeber now but you think that could have been the issue? love your recipes and ive tried quiet a few desserts now . AWESOME. HI! I think if water got into the dessert thats probably the probablem. Also, did it seem fully cooked when you took it out of the oven? Sometimes you need to cover the top with foil before removing this from the oven to insure the middle is fully cooked. Thanks for the kind words!! 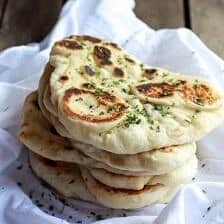 I love this recipe and get compliments every time I make this! My only major modification is to use only 2 sticks of butter in the cookie dough (no need to replace it, even) and with all the butter in the layers, has turned out wonderful each time. Thanks for sharing! SO happy you like the Baklava!! Using the 2 sticks sounds great! Thanks so much Anne! I have just come across your chocolate chip baklava. I’m a bit unsure about your quantities is butter. You mention three and two cup sticks. What does this mean. I write from England so am a bit comfused. I am so sorry for the confusion. Recipe is fixed and reads correctly. Please let me know if you have any other questions. Hope you love this! Tried it .. still in cooling process though, but it looks marvelously gooood.. smells so as well! The syrup is heavenly delicious.. love it! 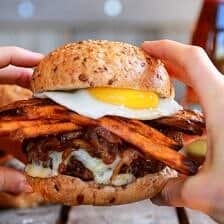 This recipe is the bomb!! Followed directions to a tee and turned out perfectly!!! Love, love, love it!! First time baklava maker so I am stoked it all turned out so great! I am so glad you loved this!! Thank you Haley!